Hi This is my daughters HP Pavilion G6 - AMD Quad Core CPU - 15.6" LCD - 500GB HDD laptop. Lid has a large scratch as pictured, apart from that everything is in good order. Comes with power lead. Has the latest windows 10 installed. Will post via tracked delivery within the UK only. 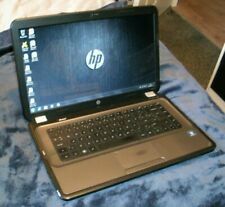 For sale an HP Pavilion G6 Laptop. 4GB RAM, 250GB Hard Drive storage. an AMD A4-3300M, 1.9GHz processor. slightly bent hinge that does not interfere with the opening of the laptop. When you receive the item you will find a simple check list that allows you to make. This laptop should be fine for people who just need a secondary laptop for basic tasks. There are stereo speakers on the front side of the laptop that sound quite good, especially for a laptop of this age. Type: Notebook/LaptopBrand: HPProcessor: Intel Core i3 1st Gen.
HP Pavilion G6. AMD Quad Core A6-3400M (1.4 - 2.30Ghz with Turbo Boost). AMD Radeon HD 6520G Graphics. 15.6" LCD Widescreen. Good Working Battery. HDMI & VGA ports. Multi Card Reader. LAN (ethernet port). Hp Pavilion G6 Laptop. AMD E2 1.7Ghz CPU. Windows 10 Pro. 15.6" HP Pavilion G6 purple AMD E-2 1.7GHz 6GB DDR3 750GB HDD Windows 10 in good condition fully working and good battery life comes with charger. Hp Pavilion G Laptop. Condition is Used but is in very good condition, a couple of minor scratches, screens in perfect condition, battery hold power very well, very good laptop, with carry case and charger. Will have full factory reset before dispatched. 160GB Hard Drive. 4GB DDR3 Ram. HP Pavilion G6-1391ea Laptop. Brand: HPProcessor: Intel Core i3 2nd Gen.
HP Pavilion g6-2298sa 15.6". 1x HP 15-b135ea 15.6". FREE 12 Months Warrenty. Our Product Note As part of the sale you"ll receive. Collection station availableType: Notebook/LaptopBrand: HPProcessor: Intel Core i3 3rd Gen. Condition is Used. Currently the system has 2GB of RAM but this can be upgraded in the future. HP Pavilion G6-1327SA - 15.6" - AMD E-2 - 4 GB RAM - 320 GB HDD. HP Pavilion G6 Specs. AMD E-2 Dual Core / 1.8 GHz. DDR3 SDRAM. AMD Radeon HD-6380G. AMD Radeon HD. HP Pavilion. lithium ion. HP Pavilion g6 series laptop upgraded to windows 10 64 bit in good cosmetic condition. Has been updated with the latest fixes so runs very well for its age one of the speakers is not working as it should the other is okay, wireless is okay. Ideal for student who just want something inexpensive. The battery takes charge but only for 2 hours. Collection station availableType: Notebook/LaptopBrand: HPProcessor: Intel Core i5 2nd Gen. Processor frequency 1.8 GHz. Processor boost frequency 2.4 GHz. Processor family AMD E. Processor manufacturer AMD. Product type Notebook. Product colour Pink. Display number of colours 16.78 million colors. HP Pavilion G6 AMD E2-1800 Dual Core 1.80GHz 12GB Ram 500GB HDD Win 7 Pro HDMI Webcam SD Card slot Battery does not charge. Good condition laptop. We have tested this machine. No hard drive is installed. Type: Notebook/LaptopBrand: HPProcessor: Intel Core i5 1st Gen. Storage 1TB HDD. Product Family Pavilion. Used, tested laptop. The hinge covers are missing, brightness function on F2 F3 does not work. Pressure marks, bright spots, and scratches on the screen. See pictures. I’m not a windows user so you will have to reset the user information. General wear and tear as expected no marks on screen. And no other issues other than mouse pad. # Approx 86 GB left of space on SSD hard drive. # Refurbished, upgraded fully functional HP Pavilion G6 laptop. FAST, STYLISH AND SOLID ! # Very little amount of wear visible on close inspection to palmrest, mouse buttons e.g. a little shining to the keys. Windows 10 is freshly installed and fully working. Microsoft Office 2007 is also installed and includes word,excel,power point,publisher,etc. 750Gb hard drive. Amd A6-3420m Quad Core 1.50ghz processor. Condition is Used. Windows 7 but can be upgraded I'm sure. Could do with a defeag & gets warm after a while (I think that the fan could do with a clean)as it's been sat & not used much.It does not effect the working of it. Brand: HPProcessor: Intel Core i5 2nd Gen.
Model: G6-2210sa Hard Drive Capacity: 750GB. Colour: Red Storage Type: HDD (Hard Disk Drive). HP G6-2210sa 15.6". 1x HP G6-2210sa. Type: Notebook/Laptop Screen Size: 15.6 in. Custom Bundle: No Hardware Connectivity: DisplayPort, HDMI, USB 2.0, USB 3.0. HP Pavilion g6. AMD A4-3320M. AMD RADEON HD 6480G. When will I receive my item?. AC Adapter. Battery Condition. Condition IN GOOD CONDITION WITH SIGN OF WEAR ON MOUSE PAD. 3 USB PORTS. Windows 10 is freshly installed and fully working. Microsoft Office 2007 is also installed and includes word,excel,power point,publisher,etc. Hp Pavilion G6-2241SA 15.6" High Spec Slimline Laptop Windows 10. Specification: HP G6. Webcam: HP Webcam. The laptop are tested, securely labelled and in a full working order. Weight : 2.5 kg. Card Reader: SD card. HP Pavilion G6 15.6" 320GB, Intel Core i3, 2.4GHz, 3GB RAM Notebook Laptop. The HP Pavilion g6 Notebook PC series has it all. Ticks every box. And that’s not all, the HP Pavilion g6 Notebook PC series is pre-loaded with software to entertain, secure, manage and altogether improve your digital life. HP PAVILION G6-1130SA PINK - AMD E-350 1.60GHz - 4GB RAM - 320GB HDD. Hard Drive 320GB. Processor AMD E-350 @ 1.60GHz. Warranty starts the date you received your item. We record all serial numbers and discrete security seals are added to prevent fraud. 320 GB SATA HDD. HP Pavilion G6-1390sa. 6 GB DDR3 RAM. 3 x USB 2.0 Ports. Altec lansing speakers. The HP Pavilion g6 Notebook PC series has it all. - 8GB RAM for smooth multi-tasking. 8GB - £35.00. With the HP Pavilion g6 Notebook PC series you can keep on working on the go, featuring integrated 10/100 BASE-T Ethernet LAN 802.11 b/g/n. Brand: HPProcessor: Intel Core i3 3rd Gen. The laptop still works really well besides all of the stated above. HP G6-1195 laptop (scratches on the red lid which are visible close up or in the reflection of light). - Red and black. - 15.6" (39.6cm) LCD Screen. - Charger included (last tested for electrical safety in 2012) / battery life up to 5 hours. - Intel Core i3 processor. - 3GB memory. - 64-bit Windows 7 Home Premium Edition. - 320BB Hard Drive. - 3 USB Ports. - DVD drive. * Condition is Used* Laptop overheats and the fan is noisy when in use. Would likely be ideal for parts or to be refurbished. Everything personal has been deleted. HP Pavilion G6-2244SA Windows 10 Pro - Laptop/Notebook . Condition is Manufacturer refurbished. Dispatched with eBay delivery – Shutl 1 day. Storage 1TB HDD. Processor AMD E2-3000M 1.80GHz. Graphics Adapter 512MB ATI AMD Radeon HD 6380G. HP Pavilion G. Used, professionally tested HP Pavilion. A key button is missing on the keyboard, otherwise, the laptop is in fully working condition. Processor AMD E2 3000M APU With Radeon HD Graphics 1.8GHz. Storage 1TB HDD. Used, tested and working HP Pavilion g6. The right audio channel is faulty; the left one is working properly. The screen bezel is cracked in the top left corner. HP g6-2380sa 15.6". 1x HP g6-2380sa. Our Product Note As part of the sale you"ll receive. CPU: AMD Athlon II @2.30GHz. Storage: 500GB. HP Pavilion G6. Fully functional, other than the back light on the screen. Optical Drive: DVD Writer. AMD A8-4500M. HP G6-2213sa 15.6". 1x HP G6-2213sa. As part of the sale you"ll receive. HP Pavilion g6-2399sa 15.5" Notebook PC AMD A10 2.3Ghz 8GB RAM 1TB HDD Windows 10 A Grade Condition. AMD A10-4600M. HP G6-2399sa 15.6". 1x HP G6-2399sa. As part of the sale you"ll receive. HP g6-1210sa 15.6". 1x HP g6-121sa. Our Product Note As part of the sale you"ll receive. Type: Notebook/LaptopBrand: HPProcessor: Intel Core i3 3rd Gen.